Happy Halloween! Do you guys have plans!? Every year, I want to make myself a paper mache animal head and every year Halloween comes and goes and I don’t end up making a paper mache animal head. Instead I’ll be eating all the candy (but mostly the Twix, Kit Kats and Coffee Crisps) because I live in a condo and people don’t trick or treat the hallways. It’s been a crazy week of the weather flip flopping between perfectly blue sky sunny days and torrential pouring rain. It looks like today isn’t going to clear up too much, but I guess some atmospheric rain clouds add to the spookiness of the day. 1. Would you visit the grey market for some Trader Joe’s? 2. This KFC frying machine is strangely mesmerizing. 3. It’s actually a dream of mine to live in a prefab house. 4. This. Books as love. 5. I find celebrity profiles super interesting – especially when they’re on Nicki Minaj. 6. Be exactly who you are. 1. I want to eat this and pretend it’s the middle of summer instead of November(!). 2. Classic yellow cake dark chocolate cupcakes. 3. These pumpkin spice softies! 5. Spiced up chicken noodle soup. 6. A cinnamon roll loaf…with pumpkin! Have an awesome Halloween and first weekend of November! PS – There’s a lovely review of my book on The Kitchn AND you can enter to win a copy over at Hip Foodie Mom! 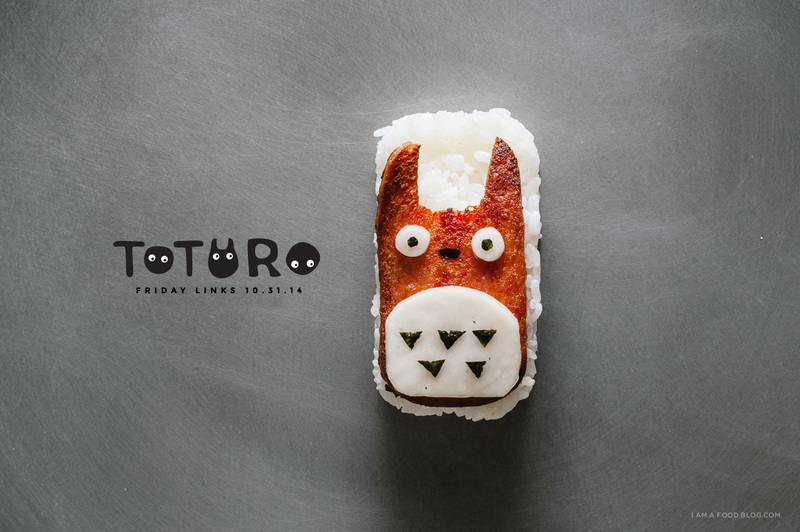 PPS – Don’t forget to check out all the lovely Totoro week posts! Lyndsay did a super cute Totoro cake tutorial and an even cuter Catbus cake tutorial. I made Totoro apple pie pancakes, Totoro baked black sesame donuts, and a Totoro jalapeño grilled cheese. Cute overload! Oh, and last year for Halloween I made Totoro spam musubis. That KFC article makes me 7 x hungrier for fried chicken — albeit, if I’m going the KFC route, I love me some Korean versus Kentucky (sorry Kentucky — it’s not you, it’s your lack-of-perfect-skin-to-flesh-air-pocketness…) Also, Sarah’s poutine!!! Yum. And I do hope you get the chance to make one of those big paper mache heads one year, because I’d certainly love to see it! Totoro maybe even? :) Happy Halloween!!! 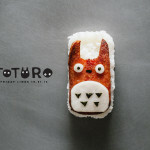 Totoro spam musubi! (I hope) you’re on your way to making Totoro food a Hallowe’en tradition… I’ll take that over pumpkins and candy any Hallowe’en (unless… a Totoro pumpkin something next year?)! Happy Hallowe’en!